Seating for eight on three rows is the claim to fame for the 2019 Chevy Traverse. That many seats is rare in the midsize SUV class. But this one feature isn't all there is to love about the Traverse, not by a long shot. After all, sales for the Traverse have never been better, so people see its value. In this guide, we'll tell you all about this year's model of the Traverse and why it might just be perfect for you and your family. Chevrolet overhauled the Chevy Traverse just last year to kick off the second generation of this teenage SUV. As a result, very little has changed for 2019. In fact, there's only one major change for this model year, and that is the availability of an 8-inch touch screen that you can put in place of the standard 7-inch screen. A few minor changes include new chromed roof rails on some trims and new optional 18-inch silver-painted aluminum wheels. Most three-row SUVs are large carbon-chugging machines, but the Chevy Traverse has a relatively small footprint while still seating eight. The amazing part is that adults can still comfortably sit on any row. You've got sufficient head, leg, shoulder, and elbow room (and probably a few other body parts we're forgetting). In fact, the Traverse has more passenger room than almost any other midsize SUV. What's more, these seats are wide and comfortable. You'll notice the lumbar support of the driver's seat, especially on long hauls and family road trips. And, in addition to all that seating space for third-row passengers, it's not at all hard to get back there either thanks to the Smartslide second-row seat. There's also a seven-seat configuration if you'd like a Traverse with captain's chairs in the second row. 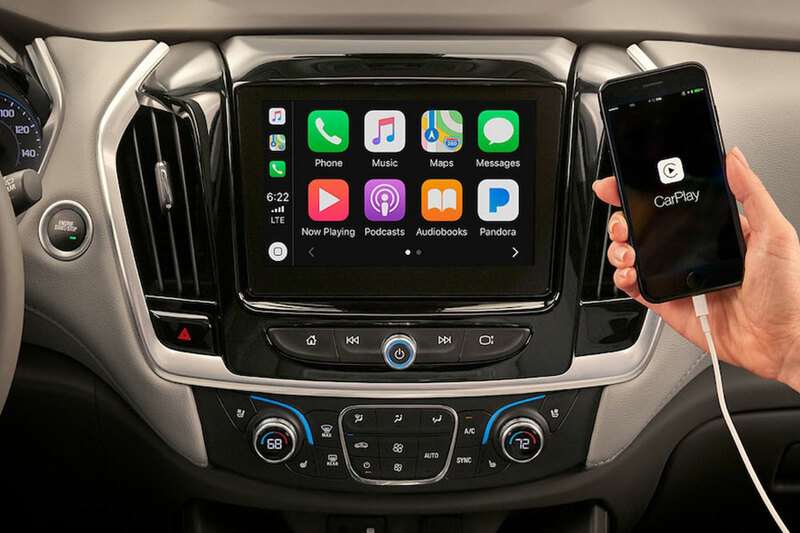 Like other vehicles in the Chevy lineup, the Traverse delivers a great infotainment system in the form of Chevy's MyLink, which is now nestled in a new instrument cluster with a big touch screen. MyLink is really intuitive and the controls all make sense. Also, voice commands are executed flawlessly. Finally, the Traverse has plenty of tech to supplement the MyLink system. Apple CarPlay and Android Auto are standard in every Traverse, which is really nice and still pretty rare. There's also a 10-speaker Bose sound system and an onboard 4G LTE Wi-Fi hotspot. We'd be remiss if we didn't mention this one last thing. The 2019 Chevy Traverse is about the smoothest ride in its class. The transmission is smooth, whether speeding up or downshifting. And the ride is silky, even when rounding corners, with only the barest whisper of body roll. But you don't feel like you're floating while driving the Traverse either, thanks to an expertly-tuned electric power-assist steering system that gives you plenty of road feel for an authentic and enjoyable driving experience. This is as close to you'll get to a sports car in a dedicated family hauler.